For the swatches I used 2 coats of Alessandro's Pro White Hologram Lavender, 2 coats of Midnight Purple, 2 Coats Revlon Top Coat Fixateur and for the thumb an extra coat of Essence Nail Art Glitter Tope 02 Shiny Star. The Essence Polish has got tiny squares , middle sized circles and little circles- all of them are some kind of holographic and seem to be made from the same material. Today I want to "praise" the (by far) best Top Coat I've ever used: Revlon's Top Coat Fixateur. It's by far the best fast drying Top Coat. How I discovered it's "magic"? Today I did my manicure as usual- a nail strenghening base coat(Catrice Nail hardener extra stron), then two coats of China Glaze's Octa gone wild and shortly after ( the layers weren't even dry yet) i've did a coat of Revlon's Top Coat Fixateur. I'm sorry I don't have any swatch-pics yet- i'm quite lazy at the moment plus a headache isn't that good. There's a giveaway at Swatchcrazee and she's giving a big pack of polishes- it's 14(!!) 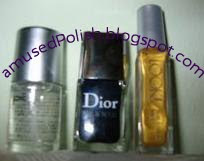 Seche polishes. Contest ends on 30th September. There's a giveaway at Ivana's Beautyblog. She's giving away 3 (yes, 3!!) sets. Contest ends next Sunday. Es gibt ein Gewinnspiel bei Ivana's Beautyblog und es gibt gleich 3 großartige Preise dafür. I just wanted to tell you guys there's a giveaway at Allyoudesire. The contest closes on the 30th. Edit: Is the Revlon fast drying Top Coat a good buy? There are a few reviews that say so. the actual colour is a tad darker- i don't know why my camera pictures it lighter than it really is. It also has got a plain black inner lining. 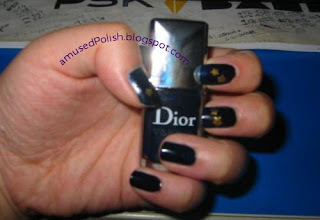 Today I want to show you my first swatches- My NOTD is Dior Vernis Poison Blue- my first really expensive and I must say I love this colour. It's a really dark navy blue and after two coats it was opaque and looked almost like black. I've also added some Stars with those kind of stickers where you polish over and remove the sticker when it's dry. I got those from Claire's. Edit: the polish chiped today and this means I'm in desperate need for an good (quick dry!) Top Coat- any suggestions? Kellie from the blag "also known as" is having a giveaway. So if you haven't entered yet, you can do this- it closes on the 27th.